After Guardians of the Galaxy 2 hits theaters in just a few weeks, many fans will be looking forward to the next big superhero adventure, Warner Bros.' and DC Films' Wonder Woman, which arrives in June 2. This next chapter in the DCEU saga takes fans back to Diana Prince's (Gal Gadot) homeland of Themyscira, and to the battlefields of World War I. A new piece of concept art has surfaced today, which reveals the one moment where Diana of Themyscira becomes the hero we have come to know as Wonder Woman, along with new details from Gal Gadot. Entertainment Weekly debuted this concept art, which showcases a scene set during World War I in 1918. Gal Gadot's Diana of Themyscira must leave her idyllic homeland to "discover her true power," which leads her to a war-torn Europe, in a scene that takes place halfway through the film. Diana finds herself between English and German forces, and while she isn't supposed to intervene, Diana decides not to play by the rules and save the women and children threatened by the Germans. Here's what Gal Gadot had to say about this powerful scene below. "It's a very powerful moment. We have a character committing to her true self, doing what she believes needs to be done." 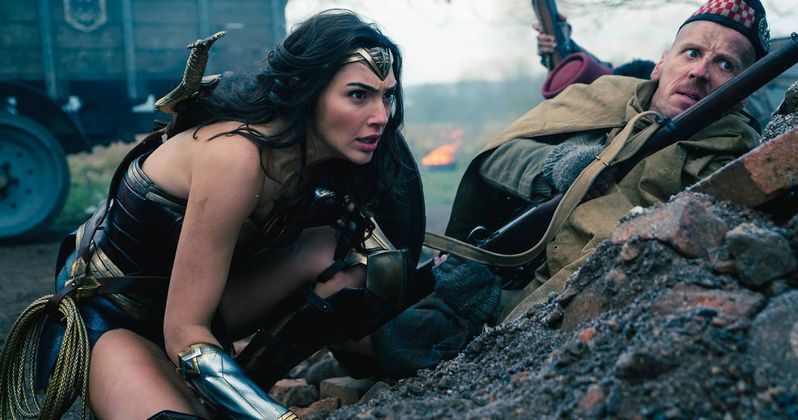 Diana becomes involved in this conflict after Steve Trevor (Chris Pine) crashes his plane near her island of Themyscira, after he is being pursued by the German army. Steve Trevor has discovered that a German general, Erich Ludendorff (Danny Huston), is planning on releasing a chemical weapon that could kill millions, which is why Diana decides to get involved. Director Patty Jenkins equates this scene where Diana finally gets involved, to Clark Kent ripping open his dress shirt to reveal his Superman suit. Executive producer Geoff Johns agrees with this analogy, but thinks it's much more powerful. ""[This scene] reminds me of when Superman caught Lois and caught the helicopter [in the 1978 movie]. But this one is even more visceral." Earlier this month, box office analysts predicted that Wonder Woman would have a huge opening weekend, debuting with an estimated $80 million. While that number isn't nearly as big as Batman v Superman: Dawn of Justice's $166 million opening or Suicide Squad's $133.6 million opening, it's possible that Wonder Woman has more longevity than both of those movies, which had huge openings followed by massive week-to-week decreases. Wonder Woman was one of the few highlights of Batman v Superman for many critics, so it's possible that this movie could get the DCEU back on the right track. Take a look at this concept art below as we get closer and closer to Wonder Woman's June 2 release date.